Black washcloths 100% cotton size 13X13, great for any commercial use or business that needs a heavy weight face towel extra soft, highly absorbent. Everyone needs a washcloth sometimes, whether for personal or professional use. Why not make sure you always have an attractive, affordable one on hand for all your scrubbing, cleaning, rubbing and drying needs? 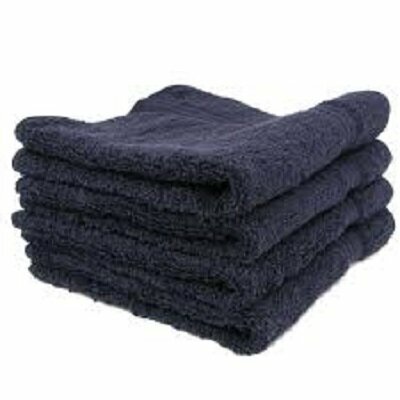 Towel Super Center offers premium-grade terry cloth black washcloths at extremely economical rates. For every dozen of these 13" by 13" 100-percent cotton washcloths, you receive discounted pricing. The more units you buy, the lower your per-washcloth rate. Order black cotton washcloths today from the convenience of your mobile device, tablet or computer! Have you ever had to deal with a washcloth that fell apart after the first few uses? It's frustrating, not to mention expensive. What you need are dependable washcloths that won't let you down. Each of these black washcloths offers softness, plus double-stitching on the hems on all sides. This gives you the confidence you need to make your purchase today knowing you won't have to continually reorder week after week. Hotels, Motels and Inns. You're all about hospitality, so be sure your washcloths show your professionalism. Every guest will be glad they chose your establishment when they're greeted with a premium black washcloth that feels wonderful and performs admirably. Gyms and Health Clubs. We all know the gym is a place where people regularly need towels and washcloths. Be sure you have them available for use. Black makes a particularly great color choice because it's so forgiving of small stains. Grooming. As a pet groomer, you're always reaching for a towel. Even a washcloth can be convenient to use for scrubbing down a pet or just wiping off your hands. Car Detailing. Auto detailing is big business. It also is tough work that requires the right tools for the job. Don't let these black washcloths fool you — yes, they're soft to the touch, but they'll work as hard as you do, day-in and day-out. Spas and Salons. When was the last time you found yourself in need of new washcloths for your workers and customers? Spas and salons have constant uses for towels of all sizes, including 13" by 13" premium cotton varieties. You'll love not having to run out to a local retailer to get sub-par washcloths because you'll always have exactly what you need in your linen closet! Discover the attractiveness and durability of premium black cotton washcloths for your company right now. Place your order today. Who says you can't order wholesale washcloths for your home, too? At Towel Super Center, we offer all our customers the same opportunity for discounted rates. This allows you to have black washcloths for all the bathrooms in your home without compromising on quality or over-spending. Let us become your towel partner for life. Order your black wholesale washcloths today!